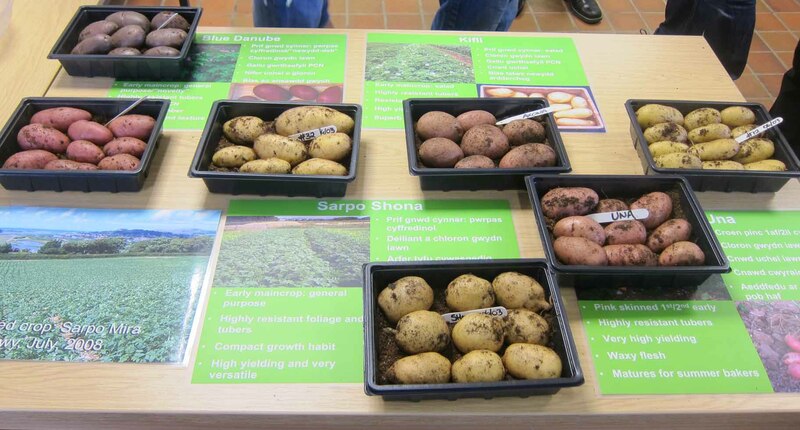 The future of the Sarvari Research Trust – which researches and produces non-GM blight resistant potatoes – is in doubt, said its director, Dr David Shaw, at the Trust’s 10th open day, near Bangor, North Wales, Friday last (3 August). As little as £100,000 a year could make all the difference. Despite producing a range of blight resistant red and white skinned potatoes, with names such as Sárpo Mira, Blue Danube and Kifli, with a growing uptake, they face a catch 22 situation over financing to scale up the production of seed potatoes to a level that would also support the work of the Trust, as its government and charitable financing runs out. They have had requests from around the world for the potatoes, including from DR Congo, Egypt and Sweden. 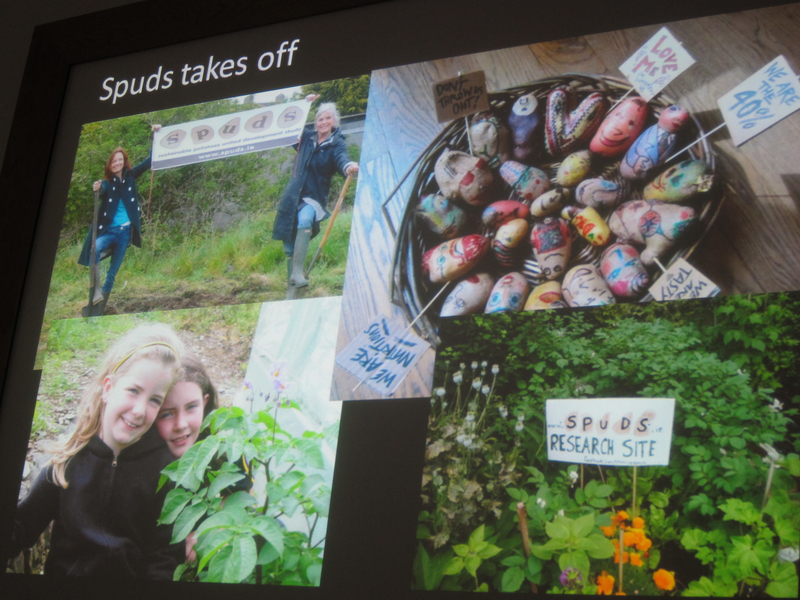 Earlier this year they responded to a request from Ireland from SPUDS – Sustainable Potatoes United Development Study – which is pioneering a people-led piece of research to show their suitability in Ireland. Nike Ruf enthusiastically described how, in response to the Irish agriculture and food development authority’s, Teagasc’s, application for GM potato trials, SPUDS gave away the non-GM blight resistant potatoes around the country for individuals to grow as well as recruited commercial growers into the trials. As of last week, they are all reportedly doing well with no blight, and taste tests are planned post harvest to demonstrate consumer acceptability. Varying levels of municipal green waste compost applications can alter the dry matter content of their potatoes and so affect their suitability for different end uses according to research done over the past year by the Trust’s trials and seed manager, Simon White. It is his future that is most immediately threatened if they cannot find further funding very soon. 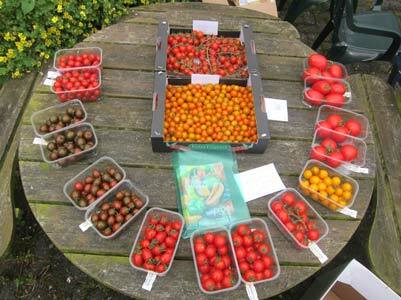 As well as potatoes the Trust has been working with ProVeg seeds on tomatoes, which are also affected by blight. ProVeg are funding part of the tomato work of the Trust. Jamie Stroud, a PhD student on the KESS scheme is identifying resistance genes to late-blight disease of tomato – and he showed guests around the tomato trials. This has been an exceptionally good year for blight occurring – with a farmer at my local farmers market yesterday saying this year he’s been spraying every 4 days not every 14 days as he does in normal years. Gary Collins of the Potato Council told the meeting the Council is still looking for more blight monitors around the country, including people growing potatoes on allotments or in their gardens. This entry was posted in Interviews and tagged David Shaw, Food waste, Ireland, non-GM, non-GM blight resistance potatoes, potatoes, Savari Research Trust. Bookmark the permalink. We are surprised to hear from Nike’s interview that some Irish potato growers have said that they would not grow Sarpo varieties because they do not store well. This is the first we have heard about not storing well. We have grown hundreds of tonnes of Sarpos in many different conditions and have stored them over the winter period. Our experience is that even in non-cooled, ambient stores, potatoes will store in good edible condition right through the winter and often into late Spring. I have seen Axonas for sale in a farm shop in early June and many of our customers have commented on their long natural dormancy It means that they do not need treatment with sprout suppressing chemicals and/or refrigeration. This of course is an attaractive feature of our varieties for those who want to grow sustainably. I can only conclude that the criticism of not storing well is a rumour.